FinTech is the buzzword in Indonesia banking industry for the past one year. Financial Technology is an integral part of financial enterprises digital transformation to improve customer service. In addition, with higher demand for innovation, banking company will have stronger competitive value in the market. Therefore, the needs for disaster recovery in any banking company must be strengthened to support the development and operations. Digital transformation enabling smaller banking company on par with large companies. FinTech startups companies have been started since mid 2016, it is an early sign of financial sector technology era in Indonesia..
At first, the digital transformation of the banking company will aim to produce a good application for internal purposes as well as applications for customer transactions. Then proceed to improve the usability of application by adding new features continuously. Thus, companies get more qualified applications from time to time.. In FinTech era, Competition in the banking company will be more focusing on the usefulness or quality of their transaction application. 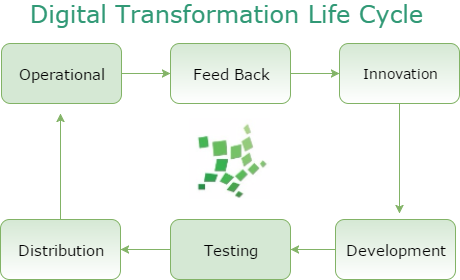 This requires a software development life cycle (SDLC) to be able to improve the quality. Improving Fintech application quality should have solid base, agility is tested and also has good usability. Adding new features in this case is a continuous innovation (CI). This will involve feedback from users, both from customers and from operational employees. Thus, the banking services will run more smoothly, can be as easy as possible to use, secure, and faster. However, on the operational and developer (Dev and Ops) side, these innovations require testing environment for live testing support. If not, it will increase downtime on a running system. This could encourage “thinking dilemma” for the company’s leaders. To carry out digital transformation, it takes strong leadership with full confidence in the digital transformation process and results. Downtime is a worst nightmare in Fintech industries. To overcome this challenge, company should include the best fail-over system in their digital transformation plans and strategies. Almost all banking companies already have documented disaster recovery plan. They already have standard operating procedures for; data replication, backup execution, as well as for the active-to-active scenario. In addition, Indonesian law requires that a company that provides public services using electronic systems must have a disaster recovery site in Indonesia. Adoption of digital technology shall generate additional business applications and systems, which simultaneously raises the need for safeguards. Up time is a key factor of continuity in banking operations and even more so in this FinTech era. Day to day banking mission critical operations should be always available even if there are problems in their systems. Speed. The faster system can switch to secondary system, potential downtime and data loss will be decrease. Latency. Look for the best disaster recovery site locaction, companies can reduce data loss and data disintegrity. Performance. Using a dedicated disaster recovery services can improve a fail-over systems performance. Security. The backup system must not be mixed up with other parties interest in it. By using a dedicated disaster recovery services, it will make your backup system and data more secure..
By paying attention to those 4 things, companies no longer need to worry about downtime will often occur in your FinTech application during new features testing. Apart from being one of government and Bank Indonesia requirements, disaster recovery is the eligibility standards of information technology for financial institutions. The era of digital transformation in Financial Technology produces competition, while downtime is not an option. Elitery is a company that focus on providing reliable, efficient and scalable IT infrastructure. With our international standard Data Center and certified experienced team that will ensure of all our clients business process continuity. We will be more than happy to answer your question, feel free to contact us at (+62-21) 750-2976 or by filling following contact form. Thank you..